You can’t get much more American than apple pie. And any time of year is a good time to indulge in a delicious slice. Whether you’re picking up a pie for your next event or if it’s just for fun, check out the 10 best pie shops in West Virginia for some delicious apple pie! Red Velvet cupcakes, chocolate chip cookies, and the best caramel apple pie you ever tasted are just some of the reasons to stop by Sarah’s Bakery in Charleston. They also have traditional apple, blueberry, cherry, blackberry, and a peach Bourbon that will give you more reasons. That’s what we’re talking about. One of the secrets to tender flaky pie crust is rolling the pastry dough by hand. That’s exactly the way the pies at Oliver’s Pies in Wheeling are made, and you can taste the difference. No matter what your favorite flavor is, you’ll be sure to find it here. For a special treat, try the apple or old-fashioned egg custard pies. You’ll never be disappointed with the pies at Susie’s Pies and More. People love just about every pie made there, but popular favorites include apple, pumpkin, and blackberry, perfect for fall celebrations of any kinds. These pies are full of delicious fillings and have tender, flaky crusts. To make trying the pies made at Susie’s even better, these pies almost come to you! You can find them at the Berkeley Springs and Charles Town Farmer’s Markets. Better stock up now. Check the Facebook page for specific times when Susie’s Pies will be at the markets. You’ll know you picked a winner when you visit Sugar Pie Bakery in Charleston. And it’s not just because of all the awards they’ve won that say so. You’ll taste the difference in every pie and specialty dessert. 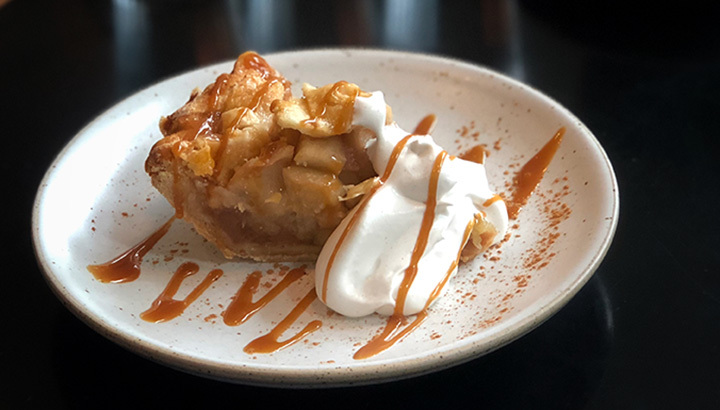 Whether you choose one of their most popular mouth-watering pies like the Apple Crumb, Buttermilk, or Peanut Butter or something else, you won’t be disappointed. They love a challenge, too, so if you have a favorite flavor, ask if they’ll make it. Old-fashioned and delicious baked goods are what you’ll find at Apple Annie’s Bakery in Morgantown. Besides melt-in-your-mouth peanut butter cookies and a coconut cake that will make you dizzy with delight, with a name like Apple Annie’s, you know you can expect the best in all things apple. That includes a tender-crusted apple pie that’s perfect with a cup of coffee or ala mode. Based on the TV show, “The Andy Griffith Show,” this simple diner, ice cream parlor and pie shop features sandwiches named after the show’s characters. With walls adorned with pictures of the show’s cast, you’ll find mile-high cream pies, and fresh fruit pies like apple, pecan, and graham cracker. To quote Barney Fife, “…there are some things beyond the ken of mortal man that shouldn’t be tampered with.” Mayberry’s in Hurricane, West Virginia is one of those things. With a location on True Apple Way in Inwood, West Virginia, you might expect the place to make great apple pies. You wouldn’t be wrong with this simple, yet classic diner called The Dining Room either. Featuring a great assortment of homemade flavors of pies and cakes, you can also get ice cream sundaes in addition to your favorite breakfast, lunch, or dinner. For a fun and funky atmosphere that serves great food, check out the King Tut Drive-In in Beckley. This is not your average diner. You can tell that from the moment you arrive because the outside hasn’t changed much since the 1950s, but whimsy takes on a whole new dimension here. And that doesn’t sacrifice good food either. Known as one of the “Top 55 Must See” places to visit in West Virginia and other awards, eat your fill of the delicious lunch and dinner menu choices, then grab an apple pie or two to take home for later. Great pies don’t have to come from large bakeries. Sometimes the small ones are the biggest surprises. This is true of Starling’s Coffee and Provisions in Charleston. Considered a small-batch bakery, handmade baked goods are a daily provision here, including favorites like cookies, cakes, tarts, and pies. There’s a brunch on the weekend, and they have no problem with special orders for vegan or gluten-free baked items. You’ll have a new favorite place to eat when you visit Mary B’s. Located in Parkersburg, you’ll enjoy great service and awesome food, especially the desserts here. Whether you try the cheesecake or one of the pecan, coconut cream or apple pies, your tummy will be doing back flips of happiness.